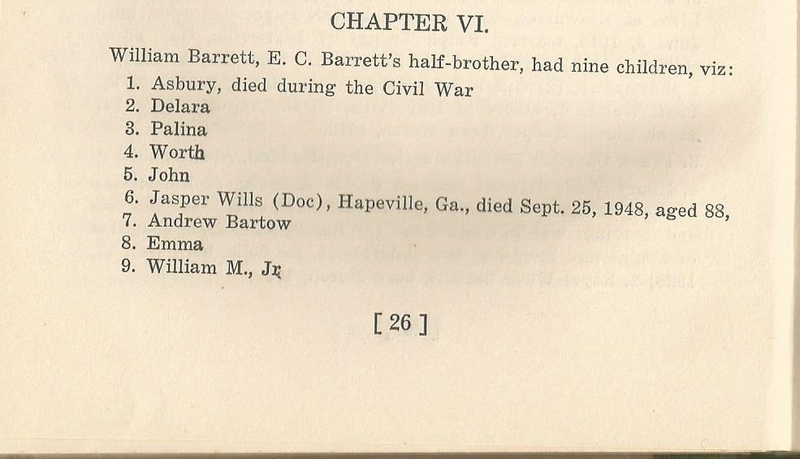 Asbury (Berry) Barrett was a son of John Barrett (born circa 1776) via his second wife, one Ms. Stanton. 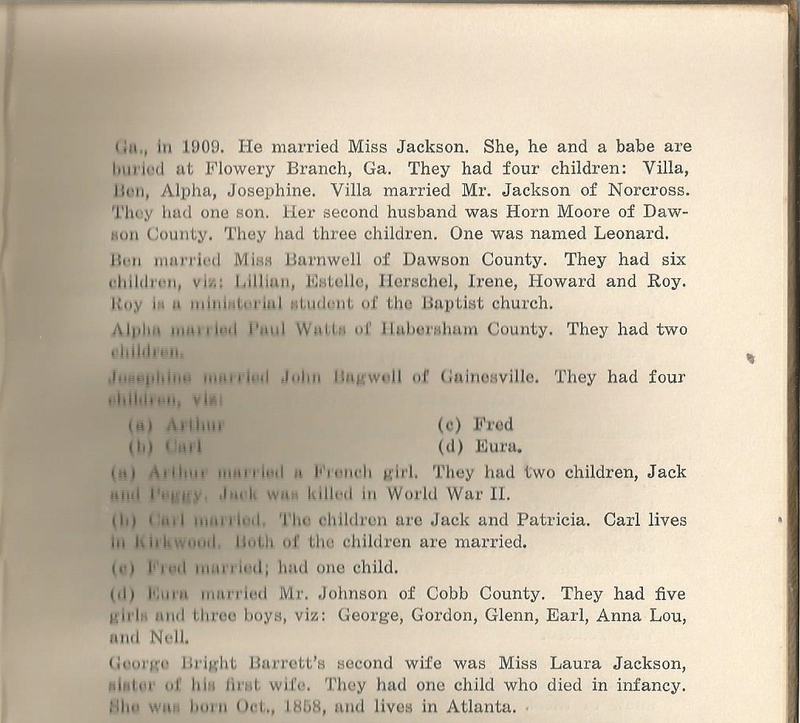 Asbury’s full siblings were John “Jack” R. Sr., Frank, and William M. Sr. His half-siblings were Elisha Chastain Barrett (1806-1886), my great-great-grandfather; and James Tarrance Barrett (1803-1867). 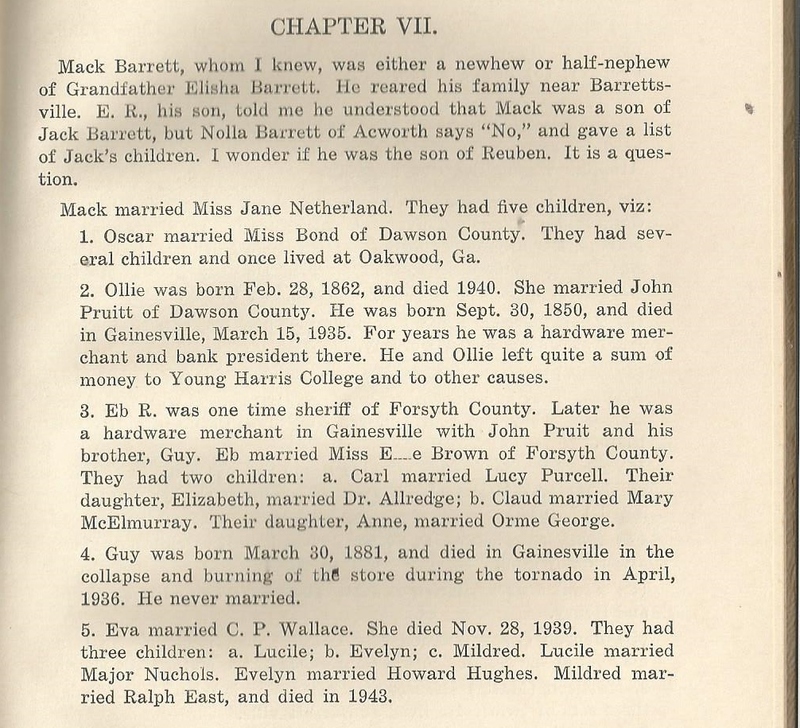 Posted September 27, 2014 by neatnik2009 in Dekalb County Georgia, Elisha Chastain Barrett (1806-1886), Habersham County Georgia, James Tarrance Barrett (1803-1867), John Barrett (Born Circa 1776), John R. "Jack" Barrett Sr., Northern Georgia U.S.A. 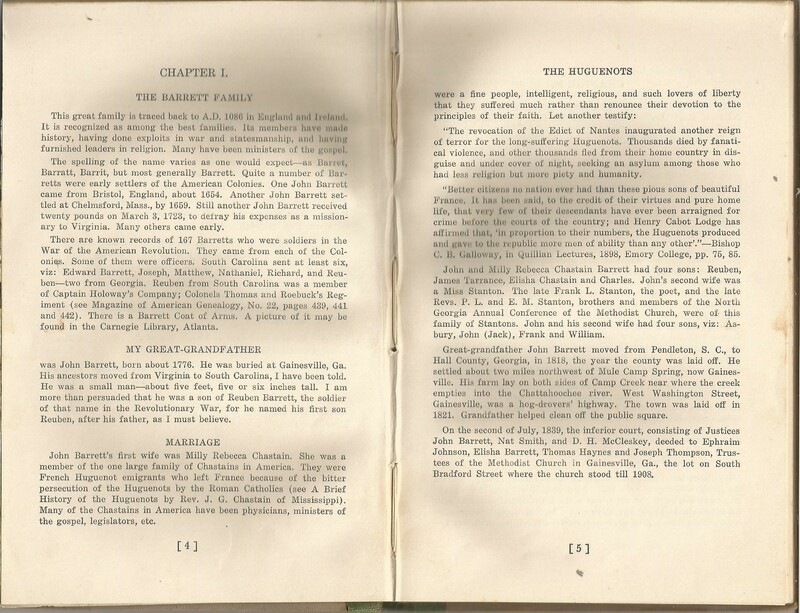 Tagged with Arthur Barrett, Asbury Barrett, Berry Barrett, Beula Barrett Purcell, Charles Barrett, Cherokee County Georgia, Cicero Barrett, Clarkesville Georgia, Dan Barrett, Edward Barrett, Emma Barrett Andrews, Etta Barrett, Frank Barrett, Gilmer County Georgia, Greene County Georgia, Harriet Roper Barrett, Holly Springs Georgia, Ida Barrett, Kellogg Barrett, Leila Barrett, Leser Barrett Allred, Mary Barrett, Milton Barrett, Mollie Barrett, Ovalee Barrett Chamblee, Pickens County Georgia, Silas Barrett, Star Purcell, Thomas Barrett Jr., Thomas Barrett Sr., Tucker Georgia, Union Point Georgia, W. W. Andrews, William M. Barrett Sr. 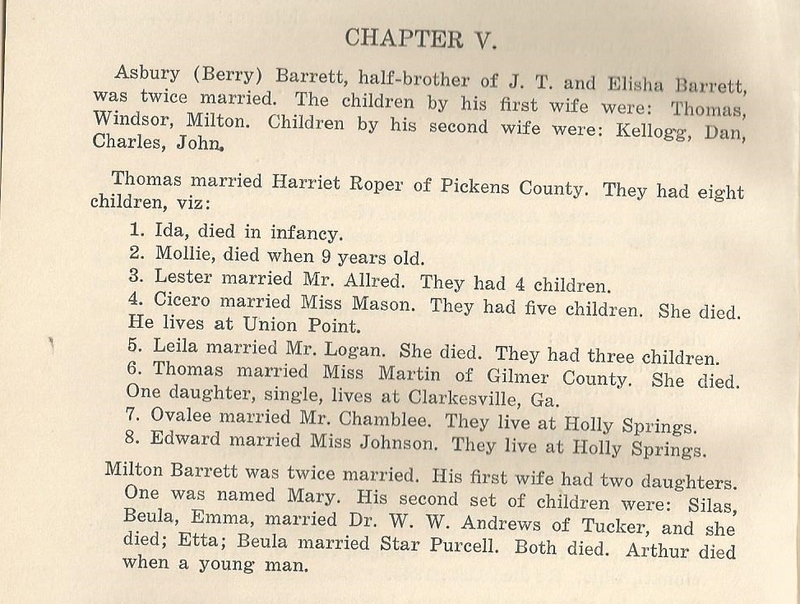 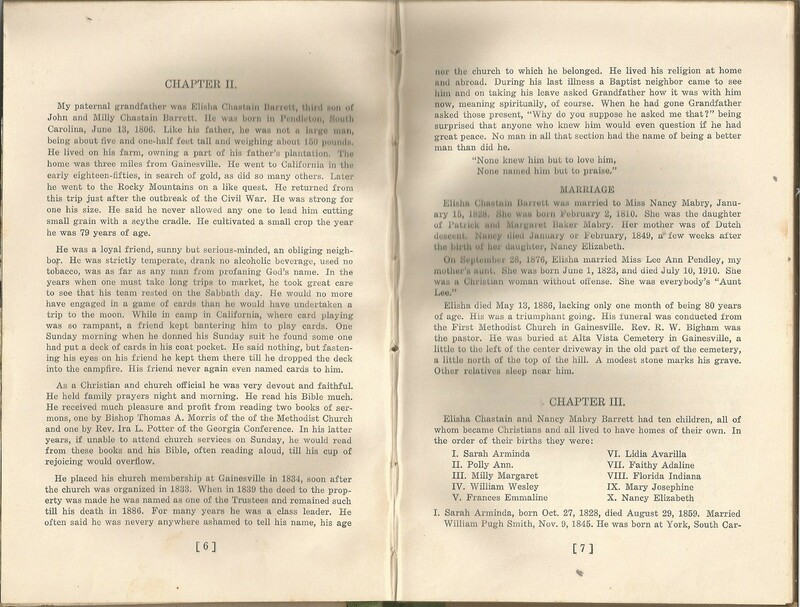 This installment consists of accounts of the lives of John Barrett (born circa 1776) and Milly Rebecca Chastain Barrett; their son, Elisha Chastain Barrett (1806-1886), and his wives, Nancy Mabry Barrett (1810-1849) and Lee Ann Pendley Barrett (1823-1910). 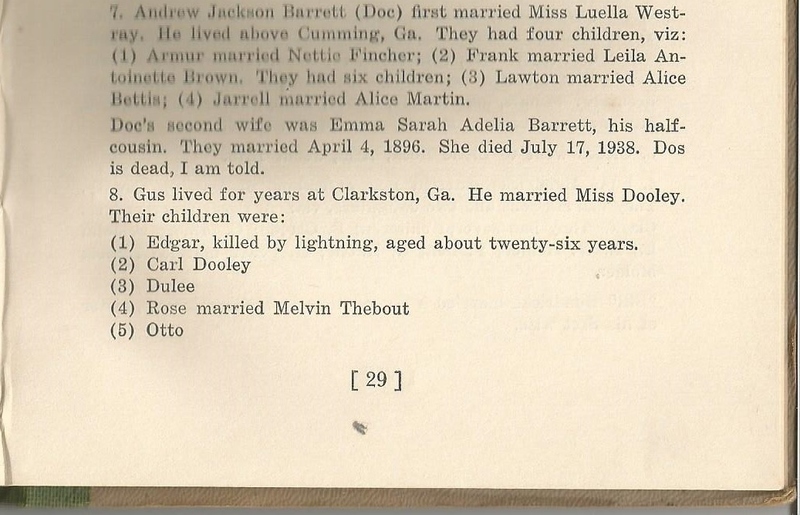 Posted September 11, 2014 by neatnik2009 in Elisha Chastain Barrett (1806-1886), Gainesville Georgia, George Washington Barrett Family History, Hall County Georgia, James Tarrance Barrett (1803-1867), John Barrett (Born Circa 1776), John R. "Jack" Barrett Sr., Milly Rebecca Chastain Barrett, Nancy Mabry Barrett (1810-1849), Northern Georgia U.S.A. 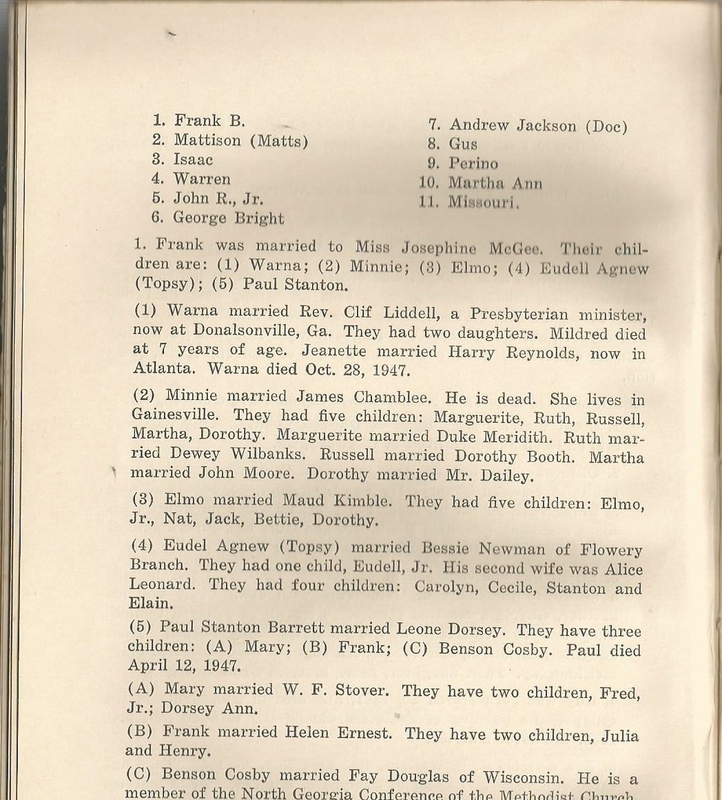 Tagged with Asbury United Methodist Church Augusta Georgia, Charles Barrett, Dade County Georgia, Faithy Adaline Barrett Smith, First Methodist Church Gainesville Georgia, First Methodist Episcopal Church Gainesville Georgia, First Methodist Episcopal Church South Gainesville Georgia, First United Methodist Church Gainesville Georgia, Florida Indiana Barrett Sitton, Frances Emiline Barrett Mason, Frank Barrett, Huguenots, John Barrett, Lee Ann Pendley Barrett, Lydia Avarilla Barrett Smith, Margaret Baker Mabry, Mary Josephine Barrett Webster, Milly Margaret Barrett Smith Long Paris, Nancy Elizabeth Barrett Camp, Patrick Mabry, Pendleton South Carolina, Polly Ann Barrett Parnell, Reuben Barrett, Sarah Arminda Barrett Smith, White County Georgia, Wildwood Georgia, William M. Barrett Sr.